As I am finishing up a project I will take the larger pieces left over, usually less than a quarter of a yard, and cut them into then largest size squares or strips possible. These all go into plastic scrap booking containers. I will go through these boxes (yes, I have more than one!) 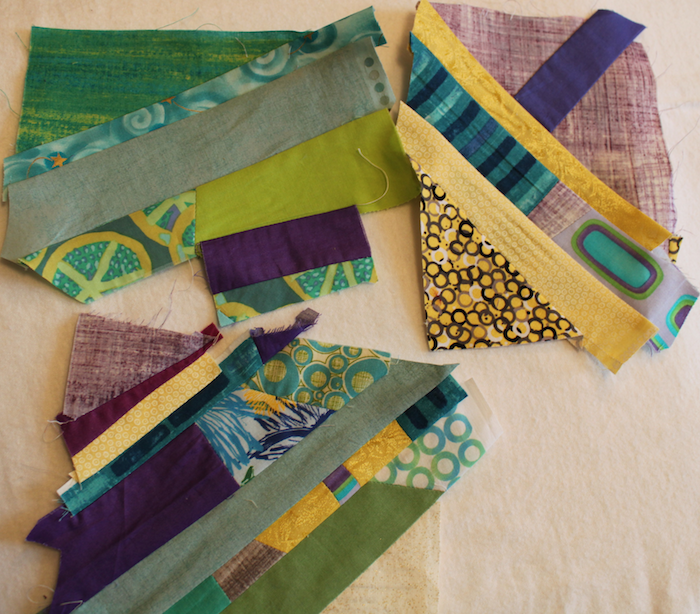 when I need a small amount of a certain colour, but generally, these scraps sit in their boxes for long periods of time. I started an improvised quilt top in the fall, which generated a fair bit of scraps. I loved the look of the colours and patterns together. 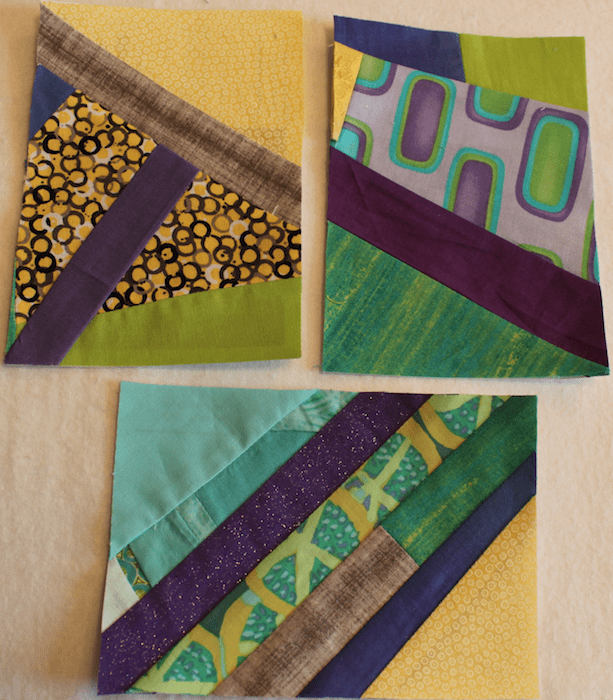 So, I decided to use these scraps to create paper-pieced rectangles. I received a calendar in 2011 that was printed with a quilting pattern-a-day. I kept the calendar even though I knew I would never make any of the quilts. Each piece of paper is 6 1/2 inches by 4 3/4 inches. This was a good size to use up the scraps I was generating. 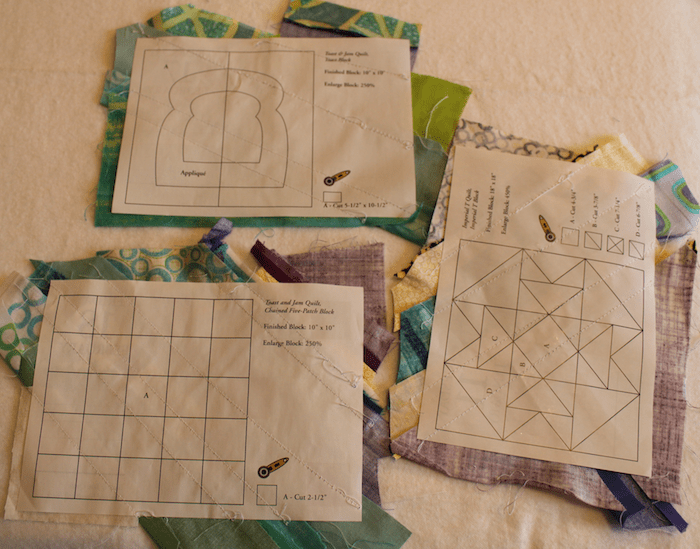 I like using the paper-piecing process when working with scraps. Since many of the scraps are not on grain, using the paper stabilizes the block. The paper stays in the block until I have either stitched it to a piece that is on the straight of grain or into a complete top. 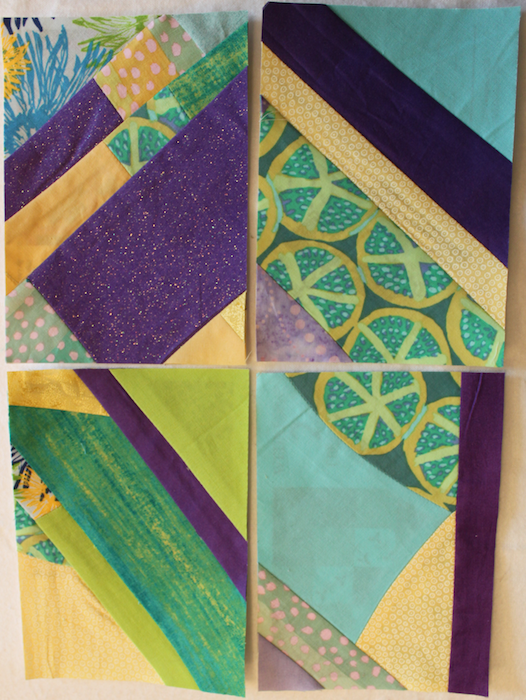 The improvisationally pieced quilt top that started this process is now completed. It actually turned into 2 finished quilts. I have used all the calendar pages up to February 21st! and don’t have any scraps to deal with! I plan on using up more of the calendar for the scraps generated from my next quilting project. I don’t know how I will join these rectangular blocks together yet. Maybe with sashing, or joined together. I will let them sit for a while. Wishing you and your families a very Happy New Year for 2015!